Rachel Zeffira, the talented, award-winning Canadian soprano, famous for her work as one-half of alt-pop duo ‘Cat's Eyes’, has composed a number of songs for director Simon Rumley’s historical gangster thriller feature film ONCE UPON A TIME IN LONDON, which is currently shooting in the East End. Rachel also appears in the movie as a singer in a 1940’s’ club band, which includes Sam Doyle from ‘The Maccabees’ on drums, Faris Badwan from ‘The Horrors’ on trumpet; and Sam Becker from ‘Wunderground’ on bass. 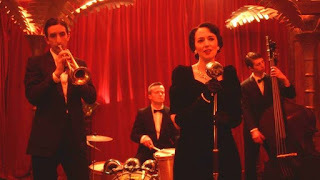 Zeffira commented: “Simon sent me the script for ‘Once Upon A Time In London’ which referenced music from the 1940s. He mentioned a few songs from that era, nostalgia ones like ‘I'll be Seeing You’ and a few songs by Kurt Weill. When I was around 16 I used to love those songs, and I remembered that I'd written a few in a similar style at the time, that could possibly be useful now. I tracked down a couple of the rough recordings and sent them to Simon, and he thought they'd be right for the film. She added “Our original choice for trumpet player, Chris Cotter, couldn't make it, so I asked Faris if he could step in. Faris is 6 foot 6, has quite a distinct look which definitely isn't 1940s, and he doesn't play trumpet. Until being on set, I've only ever seen Faris look like he's the singer from The Horrors...so it's testament to the talent of the hair and costume designers that they actually managed to make him look like a 40's jazz musician”. Director and co-writer Simon Rumley said: "Having been a fan of The Horrors for a while I was excited to check out Cat's Eyes. I went to their seminal gig at the Scala and have been a fan of Rachel and her music ever since. We were hoping to collaborate on a previous film of mine which didn't happen so when ‘Once Upon A Time In London’ came along, Rachel was the only person I thought of to sing in the Modernaires Club”. ONCE UPON A TIME IN LONDON dramatises the violent reign of two of London’s most notorious gangsters, Billy Hill (Leo Gregory) and Jack ‘Spot’ Comer (Terry Stone). Charting the legendary rise and fall of a nationwide criminal empire that lasted until the mid-fifties, this is the brutal story of post-war organised crime which paved the way for the notorious Kray Twins and The Richardsons. Described as ‘Peaky Blinders meets Legend’, the film also stars Geoff Bell, Jamie Foreman, Doug Allen, Andy Beckwith, Roland Manookian, Justin Salinger, Holly Earl, Dominic Keating, Kate Braithwaite, Nadia Forde, JJ Hambeltt, Simon Munnery and boxers Frank Buglioni, Steve Collins and Joe Egan,. ONCE UPON A TIME IN LONDON is a Gateway Films & Ratio Film Presentation, directed by Simon Rumley, written by Will Gilbey, Simon Rumley & Terry Stone and produced by Terry Stone & Richard Turner.